Next Saturday, it's Urban Tellers! Get your tickets now, today, this minute... don't miss out! Fast-paced, poignant, so perfectly Portland. 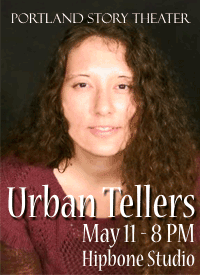 On May 11th join us for Urban Tellers. This promises to be a great evening featuring Jodi Sweetman, Barbara Jeppesen, John Gorman, Aaron Hartling, Tina Remacle, and Maura Conlon-McIvor. You'll hear real, true stories of secret siblings, band groupies, and visits to hash dens...General seating tickets are $15 in Advance (including fees! yay!) and $20 at the door, but buy your tickets today because this event is almost certain to sell out! Plus, it's the last Urban Tellers until September! Click HERE to buy advance tickets for Urban Tellers! Lawrence's Singlehandedly show about his mom and dad and his family's legacy of dirty limericks is up on YouTube! This is the show he did three weeks post surgery. It's 53 minutes long and full of naughty words, bad language, and fart sounds, so please use discretion when, where, and with whom you share this video. Here's the link: http://ow.ly/kHsio or you can just go to our web site at www.portlandstorytheater.com, click on the YouTube button and you will find it in the Singlehandedly playlist. And if you're wondering what that 'post surgery' remark is all about, please take a few minutes and read Bob Hicks' story in Oregon Arts Watch about what's happening with Lawrence Howard, here's the link: A catch in the throat: the storyteller’s story Lawrence Howard kicks off the 'Singlehandly!' festival splendidly. But the tale is far from over. We had a blast doing Singlehandedly for a 5th time and loved every moment. All of the artists, Lawrence Howard, Kriya Kaping, Lynne Duddy, Brad Fortier, Eric Stern, Annie Rosen, Annie La Ganga, and Penny Walter, had a great time working together. But it was YOU, our audience who was there for us, warm and welcoming. All of us appreciate your support. We also want to give a big shout out to our wonderful volunteers, especially Taylor Long, our Media Manager; Jeff Burke of Hipbone Studio; our videographer, Aaron Hartling; and our photographer, Scott Bump. Thanks for the generous support from the local media, with special recognition to Marty Hughley of The Oregonian, Artslandia, BePortland, Brown Paper Tickets, and Oregon Arts Watch. Our festival is all about creating experiences that celebrate storytelling as solo performance. Singlehandedly was funded in part by a generous grant from RACC (Regional Arts & Culture Council). Yay!